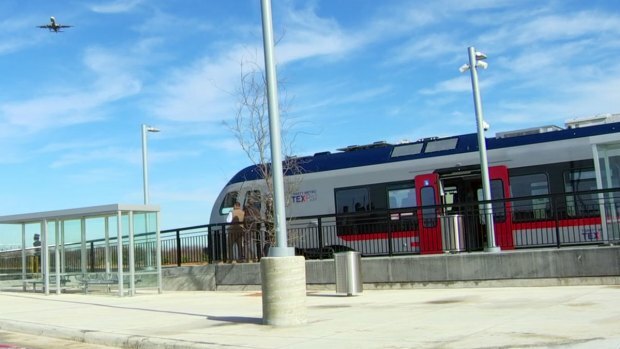 Two weeks of the partial government shutdown could lead to some delays in the long-awaited launch of TEXRail train service connecting downtown Fort Worth and Dallas-Fort Worth International Airport. A key inspection is still needed by the Federal Railroad Administration (FRA) before the full service can launch. Furloughs have resulted in skeleton crews for the FRA, which has led to some strains in completing inspections before deadline. "The FRA has pledged to do their best in spite of the government shutdown to get someone out to do the inspection," said Paul Ballard, president and chief executive officer of Trinity Metro. As of Friday morning, the inspection wasn’t completed, but Ballard said the train can launch Saturday morning as planned with or without the inspection. Before it begins regular service to Dallas/Fort Worth International Airport, passengers holding "golden tickets" got a ride on TEXRail's ceremonial first run. “We are going to be running from the airport and we believe we will be going all the way to downtown Fort Worth to the TMP, however we have to wait and see,” Ballard said. The stretch of track still requiring inspection is under Spur 280 in Fort Worth. Ballard said until the last inspection is complete, the train will only travel through the approved tracks. Only the last two stops would be affected, but there is a plan to accommodate affected riders. “There is bus service that connects downtown right to 28th Street right there,” Ballard explained. Trinity Metro will know by the close of business Friday if the inspection is complete.